Born 26 March, 1748 at Amettes in the Diocese of Boulogne, France; died in Rome 16 April, 1783. He was the eldest of fifteen children. His parents, Jean-Baptiste Labre and Anne-Barba Grandsire, belonged to the middle class and so were able to give to their numerous offspring considerable opportunities in the way of education. His early training he received in his native village in a school conducted by the vicar of the parish. The account of this period furnished in the life written by his confessor, Marconi, and that contained in the one compiled from the official processes of his beatification are at one in emphasizing the fact that he exhibited a seriousness of thought and demeanor far beyond his years. Even at that tender age he had begun to show a marked predilection for the spirit of mortification, with an aversion for the ordinary childish amusements, and he seems from the very dawning of reason to have had the liveliest horror for even the smallest sin. All this we are told was coexistent with a frank and open demeanor and a fund of cheerfulness which remained unabated to the end of his life. 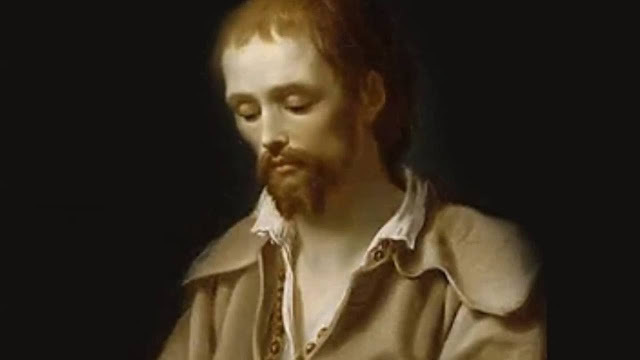 At the age of twelve his education was taken over by his paternal uncle, François-Joseph Labre, curé of Erin, with whom he then went to live. During the six following years which he spent under his uncle's roof, he made considerable progress in the study ofLatin, history, etc. but found himself unable to conquer a constantly growing distaste for any form of knowledge which did not make directly for union with God. A love of solitude, a generous employment of austerities and devotedness to his religious exercises were discernible as distinguishing features of his life at this time and constitute an intelligible prelude to his subsequent career. At the age of sixteen he resolved to embrace a religious life as a Trappist, but having on the advice of his uncle returned to Amettes to submit his design to his parents for their approval he was unable to win their consent. He therefore resumed his sojourn in the rectory at Erin, redoubling his penances and exercises of piety and in every way striving to make ready for the life of complete self-annihilation to which the voice within his soul seemed to be calling him. After the heroic death of his uncle during an epidemic in September 1766, Benedict, who had dedicated himself during the scourge to the service of the sick and dying, returned to Amettes in November of the same year. His absorbing thought at this time was still to become a religious at La Trappe, and his parents fearing that further opposition would be resistance to the will of God fell in with his proposal to enter the cloister. It was suggested, how ever, by his maternal uncle, the Abbé Vincent, that application be made to the Carthusians at Val-Sainte-Aldegonde rather than to La Trappe. Benedict's petition at Val-Sainte-Aldegonde was unsuccessful but he was directed to another monastery of the same order at Neuville. There he was told that as he was not yet twenty there was no hurry, and that he must first learn plain-chant and logic. During the next two years he applied twice unsuccessfully to be received at La Trappe and was for six weeks as a postulant with the Carthusians at Neuville, he finally sought and obtained admission to the Cistercian Abbey of Sept-Fonts in November, 1769. After a short stay at Sept-Fonts during which his exactness in religious observance and humility endeared him to the whole community, his health gave way, and it was decided that his vocation lay elsewhere. In accordance with a resolve formed during his convalescence he then set out for Rome. From Chieri in Piedmont he wrote to his parents a letter which proved to be the last they would ever receive from him. In it he informed them of his design to enter some one of the many monasteries in Italy noted for their special rigor of life. A short time, however, after the letter was dispatched he seems to have had an internal illumination which set at rest forever any doubts he might have as to what his method of living was to be. He then understood "that it was God's will that like St. Alexis he should abandon his country, his parents, and whatever is flattering in the world to lead a new sort of life, a life most painful, most penitential, not in a wilderness nor in a cloister, but in the midst of the world, devoutly visiting as a pilgrim the famous places of Christian devotion". He repeatedly submitted this extraordinary inspiration to the judgment of experienced confessors and was told he might safely conform to it. Through the years that followed he never wavered in the conviction that this was the path appointed for him by God. He set forward on his life's journey clad in an old coat, a rosary about his neck, another between his fingers, his arms folded over a crucifix which lay upon his breast. In a small wallet he carried a Testament, a breviary, which it was his wont to recite daily, a copy of the "Imitation of Christ", and some other pious books. Clothing other than that which covered his person he had none. He slept on the ground and for the most part in the open air. For food he was satisfied with a piece of bread or some herbs, frequently taken but once a day, and either provided by charity or gotten from some refuse heap. He never asked for alms and was anxious to give away to the poor whatever he received in excess of his scanty wants. The first seven of the thirteen remaining years of his life were spent in pilgrimages to the more famous shrines of Europe. He visited in this way Loreto, Assisi, Naples, Bari, Fabriano in Italy; Einsiedeln in Switzerland; Compostella in Spain; Parav-le-Monial in France. The last six years he spent in Rome, leaving it only once a year to visit the Holy House of Loreto. His unremitting and ruthless self-denial, his unaffected humility, unhesitating obedience and perfect spirit of union with God in prayer disarmed suspicion not unnaturally aroused as to the genuineness of a Divine call to so extraordinary a way of existence. Literally worn out by his sufferings and austerities, on the 16th of April 1783, he sank down on the steps of the church of Santa Maria dei Monti in Rome and, utterly exhausted, was carried to a neighboring house where he died. His death was followed by a multitude of unequivocal miracles attributed to his intercession. The life written by his confessor, Marconi, an English version of which bears the date of 1785, witnesses to 136 miraculous cures as having been certified to up to 6 July, 1783. So remarkable, indeed, was the character of the evidence for some of the miracles that they are said to have had no inconsiderable part in finally determining the conversion of the celebrated American convert, Father John Thayer, of Boston who was in Rome at the time of the saint's death. Benedict has proclaimed Venerable by Pius IX in 1859 and canonized by Leo XIII 8 December, 1881. His feast is kept on the 16th of April, the day of his death.